We have a new sketch for you at Let's Get Sketchy today! Hope you'll play along! 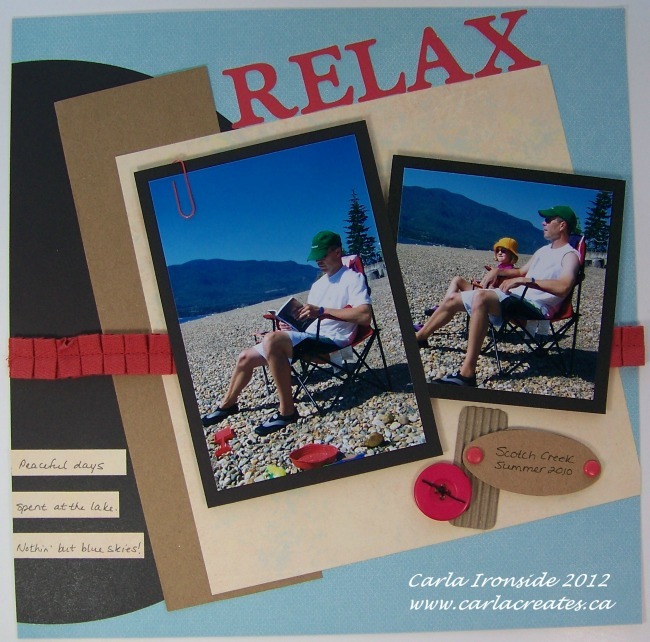 I used a retired CTMH paper collection called "Caboodle" and added some pops of red to brighten things up. Title and circle were cut with the CTMH Art Philosophy Cricut cartridge. All embellies & ribbon are CTMH except for the button which I dug out of my stash. You can find the sketch and some great inspiration from the Design Team over at the Let's Get Sketchy blog! Shop for CTMH products on my WEBSITE! great layout Carla, love the colours they are so perfect with your photo. the beach is the photo looks like a great place to hang out. I just love these colours Carla. They are muted yet so vibrant. They just match your photos perfectly.